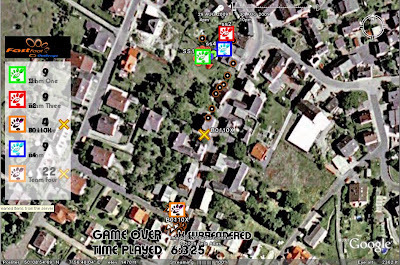 A real-time, multiplayer, GPS game for mobiles is being played out in the real-world. The game, played by groups of four or five people, uses a one kilometer radius around any point on Earth to delineate spatial extents in which three or four chasers try to capture one runner. Each one of the players is tracked via a GPS phone and their coordinates are mashed onto a map that they can all see. The only twist that that the runner is always allowed to view the map, whilst the chasers only have access to the map every six minutes. The game is a fascinating way to roll elements of the physical and virtual together into an adrenaline-pumped experience. What’s next? Fast Foot Challenge is essentially a high-tech version of tag. But, more complex games combining the physical and virtual worlds are already starting to appear. A variety of shoot-em-ups in which the mobile phone is used as a gun have been designed, and it seems only a matter of time until we start seeing a lot more of the Earth and our daily lived environments being used as a setting for interactive games. Let’s just hope we don’t ever see Grand Theft Auto ported over into real cars in the real world.